Johannes Kepler (27 December 1571 – 15 November 1630) was a German mathematics teacher, astronomer, optician, natural philosopher, astrologer and Lutheran theologian. He was Tycho Brahe's apprentice. 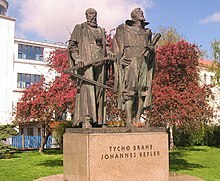 Tycho Brahe looked at the way the planets moved in the sky. Johannes Kepler found a simple way to say how the planets move. Kepler also studied other things like Kepler's supernova. Kepler's first law says that the form of the path is an ellipse, an oval or flattened circle that has two centres. The Sun is in one of the centers of the ellipse. Before Kepler, astronomers thought that planets moved in circles within circles (epicycles) according to the system of Claudius Ptolemaeus with Earth at the middle of the biggest circle. Kepler's second law says how fast the planet moves around the ellipse. When the planet is closer to the Sun, it moves faster. When it is farther from the Sun, it moves slower. If there is a line between the planet and the Sun, the line sweeps out an area as it follows the planet. The area it sweeps out in one day is always the same. Before Kepler, astronomers thought that planets always moved at the same speed along the circles. Kepler's third law says how fast different planets move. A planet that is farther from the Sun moves slower than a planet that is closer to the Sun. If a person multiplies the time (T) it takes for a planet to go around the Sun by itself (T2), that number is proportional to the distance (d) of a planet to the Sun multiplied by itself twice (d3). Kepler published the first two laws in 1609, and the third in 1619. Gingerich, Owen 1973. "Kepler, Johannes". In Dictionary of Scientific Biography, Volume VII. Charles Coulston Gillispie, editor. New York: Scribner's. Wikimedia Commons has media related to Johannes Kepler. This page was last changed on 14 March 2019, at 12:09.